Material handling is one of the most important jobs you will find on the work floor of a warehouse or storage facility. It is the bread and butter of storage. It is defined as the movement, transportation, and control of goods, parts, pieces, or products during manufacturing and distribution. Due to the broad range of materials being handled, it’s crucial that you have all the necessary tools available in order to properly handle them. The weight of materials can vary drastically from light bins to loads that weight literal tons. You should know that there are many different pieces of equipment that can make transporting much easier and more efficient. Some of them range from simple shelves to complex machines. Below you can find some of the most important examples. Transporting boxes and pallets by hand is a tiresome job. When you have a lot of open space and a smooth floor, you would want to consider an alternative. This is why tugger carts are so popular right now. They are a kind of pull cart which has a tongue and hitch tow bar attached to its posterior side, which allows it to pull just about anything that has a flat bottom. If the cargo is properly secured, it having a flat bottom isn’t exactly a necessity. Their emergence has improved several aspects of the material handling job. For starters, it’s a much safer method of transportation. Despite fuel or battery charging costs, it’s still much more efficient than other similar methods. They allow you a great deal of flexibility when moving things around and you’ll find that they are quite maneuverable for their size. These convenient carts were previously only used for manual handling when operators needed them. Many soon figured out that they can be incredibly convenient for transport when attached to a tugger train or tractor. Shelf carts offer incredible flexibility when transporting things through a production line. When you use a fixed racking system or fixed shelf system, you don’t have the ability to quickly transport materials to another part of the assembly system. They are surprisingly sturdy for their frame. Even extremely heavy loads won’t pose a problem during transportation. Each shelf can hold up to one hundred and fifty kilograms of parts, while still being stable and maneuverable. Transporting materials through a production line sometimes warrants a bigger investment. When the flow volume of the materials is high enough to make other methods inefficient and clunky, you will want to create a fixed transportation method. Conveyors offer production lines convenience and high-volume transportation, giving you extreme efficiency when used between crucial fixed points. There are several types of conveyors, depending on how they are placed. You have in-floor, on-floor, and overhead versions that transport different things. If you are using a conveyor on an assembly line, you will want something that can accumulate weight while it goes along. This is where cumulative load conveyors might be useful. You can’t talk about material handling products without mentioning the humble forklift. It’s one of the most common machines you will see in a warehouse. As its name suggests, it uses a fork to lift things and then place them somewhere else. It doesn’t have any other interesting functionalities, but it doesn’t need them either. Forklifts are a simple, yet extremely effective way to transport things both vertically and horizontally. 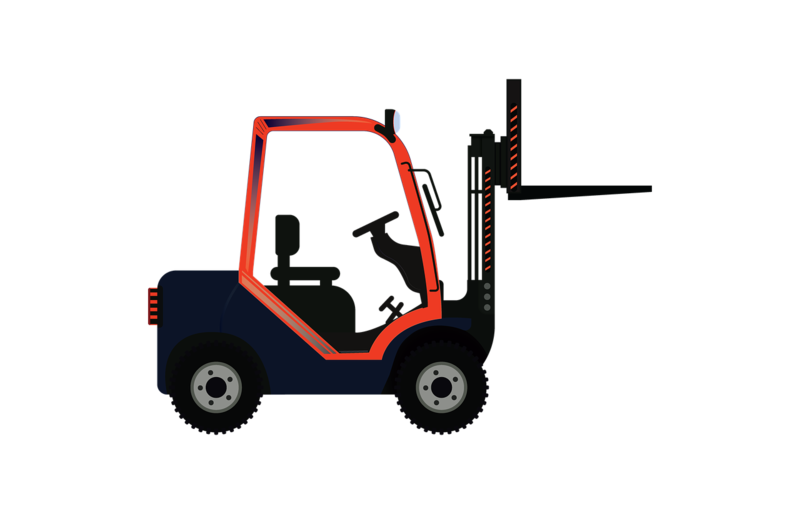 There are different types of forklifts. The most common type is the diesel-powered forklift, which is starting to go out of fashion due to environmental consciousness. Nowadays, electric is considered the way to go. These are considered eco-friendly forklifts because they don’t consume any fossil fuels and their batteries last quite a while. Forklifts tend to vary in size as well. You can have large forklifts that were designed with huge weights in mind, but these aren’t very practical on smaller scale warehouses. Smaller forklifts are usually electric and they are extremely practical if you work in tighter spaces. When your work floor is jam-packed to the point you can’t maneuver too many machines through it, that usually means it’s time to make use of your crane. Cranes offer you the ability to lift extremely heavy loads without having to take up much space at all. Because they have so much horizontal and vertical versatility, you will find that they are useful in just about any setting. The only limiting factor they have is that they need a lot of overhead space to operate. Their convenience is only held back by the danger that comes with handling them. Lifting heavy loads around personnel isn’t recommended, as failure could read to catastrophic injuries. In order to safely operate a crane, you need efficient two-way communication between the crane operator and workers on the work floor. Walkie-talkies are recommended to prevent any miscommunication. The many products that handle materials in a warehouse make working there a relative breeze. Transporting boxes and parts by hand is an antiquated thing of the past. Efficiency is the name of the game, which is why going bigger and stronger is the way to go. The kind of machinery at your disposal will help you efficiently transport material over long distances without breaking a sweat. As long as you follow safety guidelines, you will find that the job of transporting materials is pretty safe.